Based on a novel by Joe Dunthorne, Submarine tells the story of a young man named Oliver Tate (Craig Roberts), a young pseudo-intellectual who believes himself to be a great literary mind in the making. It's the latest in a long line of cinematic bildungsroman that can be traced back to The 400 Blows, with detours through The Graduate and Rushmore. Like the characters in those films, Oliver is a self-involved young man who thinks that everything happening in his life is a matter of the utmost importance. In his voiceover narration he even goes so far as to say that he imagines his life is a film in which he is the star, and therefore the story of his relationship with Jordana (Yasmin Paige) is one of the great romances of all time. None of this is true, of course. Oliver, despite being a funny, charming presence, is clearly not a great thinker but a teenage boy, and one of the joys of Submarine is the way in which writer-director Richard Ayoade captures the giddy solipsism of youth whilst never giving in to it. He allows Oliver to describe his life in portentous terms and as a series of quests, first to lose his virginity, then to try to fix the troubled marriage of his parents (Noah Taylor and Sally Hawkins). But Ayoade also subtly undercuts the pomposity of Oliver by allowing reality to assert itself upon him. Right after the moment that he and Jordana first kiss, a scene which is filled with all the drama and confusion of being young, we see Oliver being put in a headlock and beaten senseless at school when Jordana's ex-boyfriend takes offense. Later, at an awkward dinner with Jordana and her family in which a serious crisis imposes itself, Oliver sits passively by as everyone else deals with their real, turbulent emotions. Like Harold and Maude, another film which Submarine bears a striking resemblance to, if only because Craig Roberts looks like he could be a reincarnation of Bud Cort, were Bud Cort not still alive and steadily working, the film entertains the myth of Oliver Tate but never gives in to it, allowing the audience to see that Oliver's pretensions are flimsy falsehoods - that his depiction of himself as someone great and proud has about as much weight as his brief hat phase - and making his eventual realisation all the more affecting than if the film had completely taken his side. There is a real poignancy in seeing how Oliver reaches a point of self-awareness about his flaws and the way that his actions affect the people around him. Or, in the case of his parents, how his actions don't necessarily affect them. One of the greatest strengths of Submarine, and one of the most pleasant surprises it has in store, is how cinematic it looks. Ayoade displays none of the visual indifference that most actors do when they step behind the camera, and instead gives the film a rich, textured look that evokes the tumultuous emotions of its hero perfectly. He clearly has a comprehensive knowledge of the language of cinema, specifically French cinema of the 1960s. In a way, Submarine feels like an unusual follow-up to the work he did as a writer and director on Garth Marenghi's Darkplace, except rather than mimicking the mannerisms of cheap, cheesy '80s television, he is reinterpreting the joyful invention of Truffaut and Godard. If only it wasn't set in Wales in the 1980s, Submarine would be a great French New Wave film. Most importantly, Ayoade knows how to use cinematic techniques for the purposes of humour. He knows that a comedy doesn't have to rely just on its script - though his is razor-sharp, packed full of crisp one-liners delivered by a pitch-perfect cast - when shot composition, editing and use of music can be just as devastating. He also shows a delightful willingness to comment on his own technique, most memorably in a moment where Oliver says in voiceover that the film of his life is in such trouble that it wouldn't be able to afford a dramatic crane shot, instead having to settle for zooming out, before then slowly zooming out to transition to the next scene. 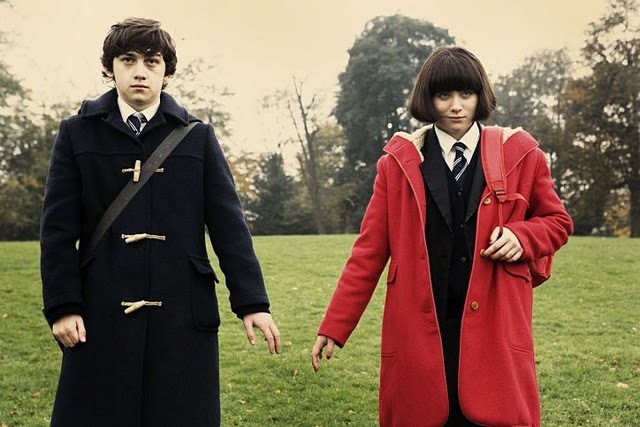 Submarine is a rare film that is hilarious and touching without being broad or mawkish. It's clever, mature and poignant, and is one of the most refreshing British films of the last four or five years. Here's hoping that Ayoade returns to the director's chair in the near future, because if he starts with a film this fully formed then we can only imagine what he could do with a bit more experience.